You may think of concrete as that dull gray material used to build sidewalks and driveways, but this remarkable material is practical, versatile, cost-effective and possesses its own unique beauty. Because it starts as a formless slurry, you can mold it into almost any shape you desire, including an attractive, functional and extremely tough, polished table top. 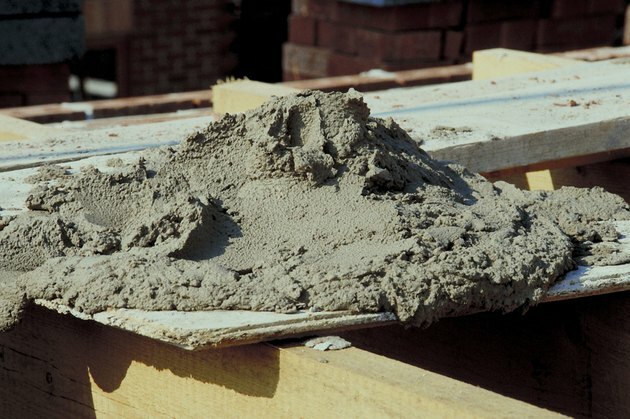 Cement can be easily molded while it is still wet. Determine the dimensions of your table top, including the length, width and thickness. Use a table saw to cut 3/4-inch thick, melamine-coated particleboard to the appropriate sizes. The melamine coating will provide a smoother finish on your concrete, which will require less polishing. Assemble your table top form. You can fasten the pieces together with a brad nailer, or you can use a hammer and nails or screws. Consider drilling pilot holes if you are going to fasten the pieces together with nails or screws. This will help keep the particleboard from splitting. Caulk the interior joints and smooth the caulk lines with your finger to create a smooth edge on the dried concrete. Mix the concrete, according to the manufacturer's directions. There is a wide variety of concrete mixes available from your local home improvement store. Consider using a variety that is specifically formulated for countertops. These mixtures can be easier to work with for molding projects, and they provide greater strength at the reduced thicknesses usually desired for concrete tabletops. Ensure all of the dry powder is completely wet and thoroughly mixed. Place your table top form onto a sturdy, solid surface. Check the form with a level. Use shims to adjust the form until is is precisely level, side to side and front to back. Pour in the concrete mixture and distribute it evenly throughout the form. Fill the form completely. Reduce any air bubbles in the concrete by gently tapping on the sides of the form until no more bubbles rise to the surface. Cover the surface with plastic sheeting and allow the concrete to cure. Different varieties of concrete have different curing times. Check the manufacturer's directions and allow the concrete to cure for the prescribed length of time, which may be up to several days, before removing the table top from the concrete form. Follow the manufacturer's directions regarding whether you need to mist the concrete with water to keep it moist during the curing process. Remove the form from the concrete table top. Pry the long ends of the frame off by using the short ends of the frame for leverage rather than the concrete. This will prevent marring the concrete surface. If the frame is stuck to the concrete, slip a plastic putty knife between the concrete and the frame to gently pry them apart. Turn the concrete table top over and set it onto a sturdy work surface. Fit an electric polisher with a diamond polishing pad. Start with a coarser grit, such as 50-grit, to grind off any extraneous material. Go back over the surface with finer-grit diamond polishing pads to at least 400-grit until you achieve the desired level of polish. Set your finished polished concrete table top on its frame.